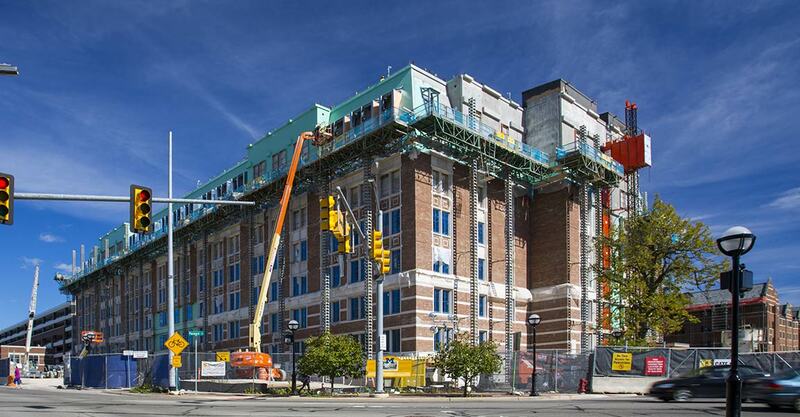 The University of Michigan Munger Graduate Residence is a new eight story residence hall situated in downtown Ann Arbor on the University of Michigan’s central campus. The residence consists of 96 apartments in which each apartment contains 7 individual bedrooms and 8 bathrooms. In total there are 730 bathrooms in the residence, all of which were constructed in a facility off site. Each bathroom was constructed off site complete with finishes, millwork and accessories, leaving only the toilet in each bathroom to be set on site. 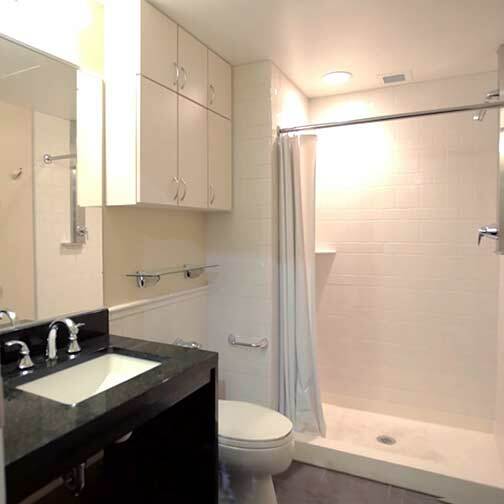 Construction of the modular bathrooms took 9 months from start to finish. 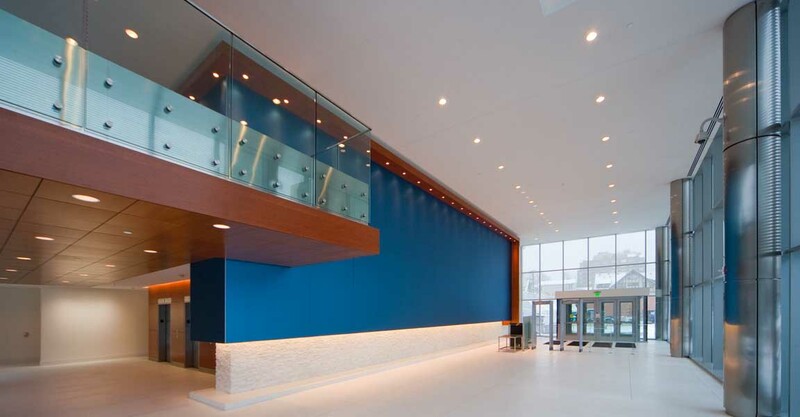 Acoustic Ceiling & Partition was contracted by Walbridge to complete the construction of 730 prefabricated modular bathroom units for the University of Michigan Munger Graduate Residence. 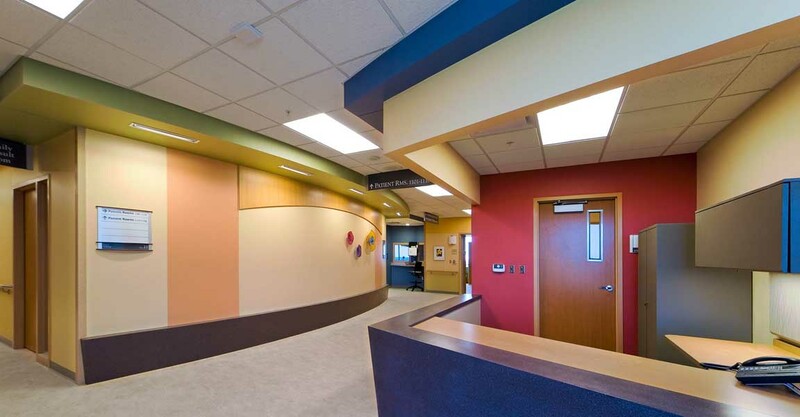 Contracted work consisted of metal framing, drywall, painting & millwork. Walbridge supplied contractors for plumbing, electrical & ceramic tile. 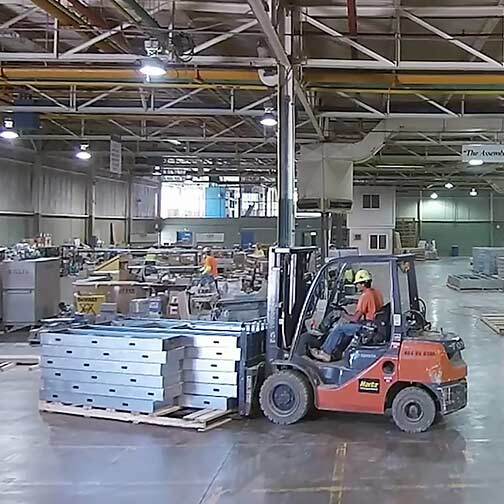 In addition to specific construction work scopes, ACP was responsible to supply a facility, within 10 miles of the building site, where the bathrooms could be built and stored until they were ready for shipping. 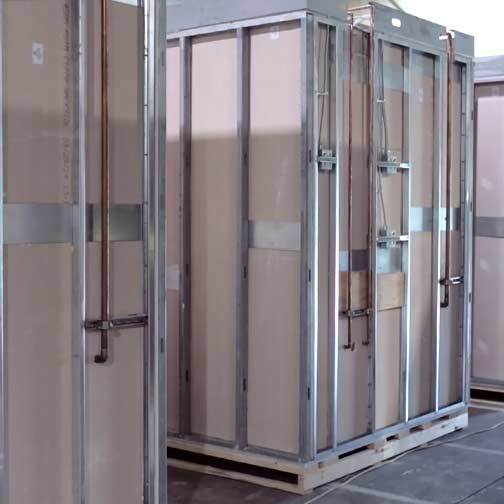 Construction of the modular bath units began in March of 2014 but several weeks prior were spent planning, designing and setting up the facility to fabricate the bathrooms. 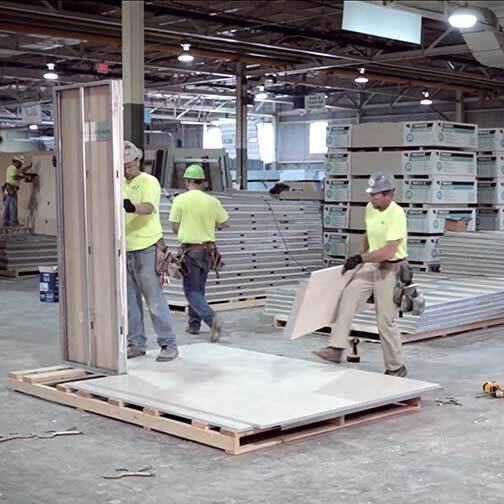 Acoustic Ceiling & Partition had to develop how the bathrooms were going to be constructed, how they were going to be transported to the job site, how they would be hoisted, unloaded and finally set in their designated place. We first built tables that would serve as templates for each size wall that had to be constructed for the different bathroom types. After wall panels were framed, plumbing and electrical was installed into the panels and then gypsum was applied to the wall surface. Wall panels were built then stored for later assembly of the bathrooms. Bathrooms were assembled on custom pallets so that they could be moved within the facility and later transported to the building site. After assembly the bath units were moved to designated locations where finishes could be installed. 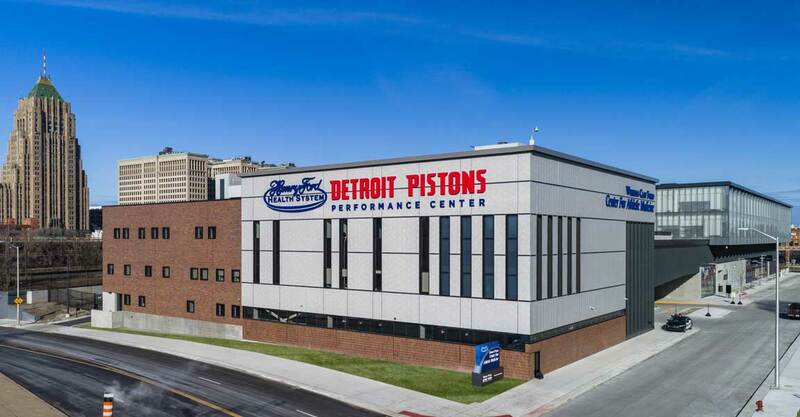 They include drywall finishing, painting, ceramic tile, mill work & toilet accessories. Finally, bathrooms were punched out, shrink wrapped and stored until they were scheduled to be shipped to the site. Several hundred bathrooms were complete and ready for installation long before the entire shell of the building was even constructed. 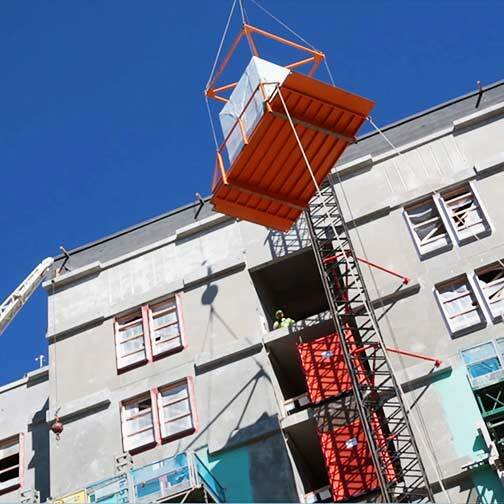 Once the building was ready to take delivery, we shipped bathrooms on a flatbed semi-trailer and hoisted them into the building with a custom lifting cage that was engineered and built specifically for the modular bath units. Schedule dictated the flow in which the units were shipped. One floor at a time, which consists of 106 bathrooms, was shipped to the site in less than 1 week. 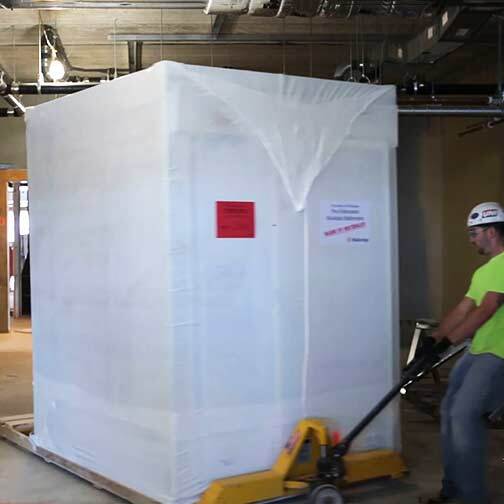 After delivery the bathrooms were taken to their designated storage place in the building and awaited scheduled installation into their final resting place.